Batley Boys player Adam Bingham and Thornhill Trojans A team coach Thomas Codman scooped awards at the Yorkshire Men’s League presentation evening held at Shaw Cross Sharks last Wednesday. Bingham was named Yorkshire Men’s League Division One player of the year after he helped the Boys to a double winning season. 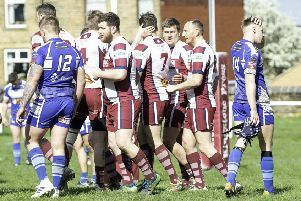 Bingham helped Batley Boys win the Division One title, while he played a key role in guiding them to win the Heavy Woollen District ARL John Kane Cup with victory over Ossett Trinity. The Boys narrowly missed out on the treble when they suffered defeat to Bentley in the Division One play-0ff final at Featherstone Rovers. Codman collected the Yorkshire Men’s League Division Four coach of the year. Codman was in his first season as coach and helped Thornhill to a mid-table finish as they won six of their 12 matches, while he also still plays as when required. Thornhill Trojans have commenced training for the Pennine League 11-a-side winter league. The team will be lead by Codman and Scott Dyson. Training takes place on Tuesdays and Thursdays from 6.3opm in Overthorpe Park, with old and new players welcome. The Trojans begin their new 11-a-side season on Saturday October 22 with a trip to Upton A. In addition to the 11-a-side league, there will be five divisions of the Pennine League this winter, playing the regular 13-a-side code, and Wyke are due kick off their Division One campaign at home to Crigglestone All Blacks this Saturday. Ossett Trinity Tigers and Hanging Heaton will compete in Division Two. Hanging Heaton start with a trip to Wakefield City this Saturday, while Ossett’s start has been delayed a week after their scheduled game against Higginshaw has been postponed. The Trigers now start at home to Hanging Heaton on October 22. Birkenshaw begin their Division Three campaign at home to Sherburn Bears on Saturday before providing Dewsbury Celtic’s first opponents, on October 22.